The U.S. Mint has allocated 1,075,000 ounces of 2015 American Eagle Silver bullion coins for sale to its authorized purchasers this week, an increase of 154,500 coins over last’s weeks total of 920,500. Last Monday, Silver Eagle bullion coins crossed the 44,006,000 sales mark, making 2015 the biggest-selling year ever for the issues. The most recent 2015 sales total stands at a record 44,850,000 ounces, which could rise to 45,925,000 by the end of the week if the high demand evidenced in recent weeks remains steady. The Mint has stated that it will wrap up production of the 2015 Silver Eagles by the end of this week, making next week’s batch the final ASE bullion issues of 2015. 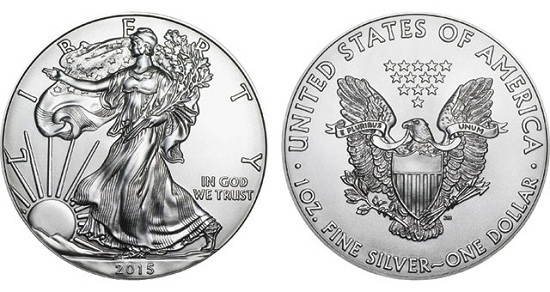 Some distributors are currently accepting pre-orders for 2016 American Eagle Silver bullion coins, but the Mint will not begin officially taking orders for the issues until January 11. American Eagle one-ounce silver bullion coins carry a denomination of one dollar; however, the value of investor coins is tied to their weight in silver, which is currently $14.49 per ounce according to the London Bullion Market Association. In figuring retail prices for the public, authorized dealers add to the Mint’s base price to cover their own expenses and profit targets, often incentivizing bulk purchases by charging less for coins ordered in large quantities. For more information on the American Eagle bullion program, please visit the U.S. Mint’s Web site.